Viktor Arvidsson scored twice, and the Nashville Predators came back to salvage a point before they ultimately fell in overtime to the St. Louis Blues by a 5-4 final on Sunday afternoon at Bridgestone Arena. It’s Nashville’s second loss to St. Louis in as many days with the Blues collecting all four of their possible points on the weekend set. Vladimir Tarasenko recorded a hat trick, including the winner just 16 seconds into OT, after the Preds potted three in the third entering the final 20 minutes with a two-goal deficit. As Predators Head Coach Peter Laviolette stated after the content, the final score is disappointing, but it wasn’t all doom and gloom following the loss. After a scoreless first period, the floodgates opened in the second, with the two clubs combining for four goals in less than three minutes. First, it was Alex Pietrangelo who gave the Blues the lead on the power play, and Tarasenko got his second of the weekend to make it 2-0. Less than 30 seconds after that, however, Arvidsson swept home a loose puck in the crease to give the Preds some life, but the Blues came right back less than a minute later as Tyler Bozak gave them a two-goal lead once more. Nashville came to life in the third as Roman Josi scored less than three minutes into the period, before Arvidsson added his second of the day at 6:10 to tie the game for the first time. After Tarasenko got a lucky bounce past Juuse Saros to put the Blues up once more, the Preds came back again, this time with Filip Forsberg batting a puck out of midair for his 20th of the season and a 4-4 draw. Forsberg hit the 20-goal mark on the play for the fifth consecutive season to become the only player in franchise history to score at least 20 in five separate seasons. That wild final stanza gave way to the extra session that saw Tarasenko complete the hat trick just seconds after it began. From here, Nashville’s schedule continues with Detroit and Montreal slated to make visits to Tennessee this week, and although the Preds still sit second in the Central with 71 points, the group says there is still work to do as the home stretch continues. Viktor Arvidsson has now scored 15 goals since Jan. 1, more than any other player in the League. Ryan Ellis collected his 200th career point with an assist on the Arvidsson goal. 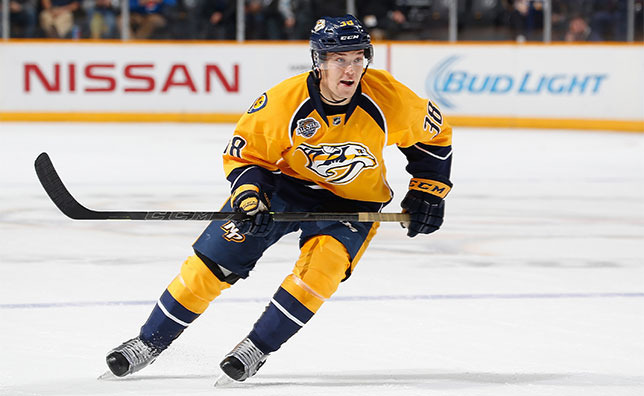 Rocco Grimaldi, Frederick Gaudreau and Matt Irwin were scratched for the Preds on Sunday. Nashville three-game homestand continues on Tuesday when they welcome the Detroit Red Wings to town, followed by a meeting with the Montreal Canadiens on Thursday.